PATCHAY.COM finds out this week the Greater KL MRT project is a dream come true for commuters who are stuck in traffic jams every week days. - Malaysia's largest megaproject and first Mass Rapit Transit (MRT) project. - The Greater KL MRT Project is one of the key initiative identified under the government's Economic Transformation Programme (ETP). - Project Delivery Partner (project manager) awarded to MMC-Gamuda Joint Venture Sdn Bhd. - Project owner is Syarikat Prasarana Negara Bhd. - Project regulator and licensing authority is Land Public Transport Commission (SPAD). - The Sg Buloh-Kajang MRT Line is the first of at least 3 MRT lines being planned, with a total length of 150km. - Estimated total costs of three MRT lines is at least RM36.6 billion. 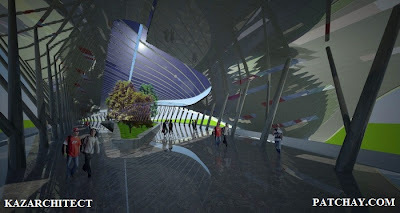 - The first phase is scheduled for ground breaking in July 2011 and fully operational by 2016. - The whole MRT project is expected to create 130,000 jobs. - The implementation is expected to generate Gross National Income of between RM3 billion and RM4 billion beginning 2011 until 2020. - By 2020, the MRT is expected to carry 2 million riders, serving over 11% of total travel across Klang Valley and 64% of travel in and out of KL City Centre. - Estimated to be between 60km to 65km in length. - 35 stations, with 11 of them incorporating park-and-ride facilities. - Population catchment of 1.2 million, with estimated daily ridership of 442,000. - Between 9.5km and 10.5km of the length will be underground. - The portion that passes through densely populated area such as Damansara and KL Central Business District will be underground. - A ride from the first to the last station will take approximately 90 minutes. - Integration with existing KTM Komuter stations in Sungai Buloh and Kajang. - Integration with existing LRT stations either at KL Sentral or Pasar Seni and Maluri. - May integrate with future MRT Line stations at Pusat Bandar Damansara and KL International Financial District (KLIFD). - Connectivity for upcoming mega urban development area such as Sg Buloh RRIM, Warisan Merdeka, KLIFD and Cochrane City. *** Probable integration with existing and future rail infrastructure. ^ KLIFD is a new megaproject located near Bulatan Pandan.